What are the Oswestry Games? Dr William Penny Brooks held the first Wenlock Olympics in 1850 to “promote the moral, physical and intellectual improvement of the inhabitants of the town and neighbourhood by the encouragement of outdoor recreation and by the award of prizes annually at public meetings for skill in athletic exercises.” This soon grew into The Shropshire Olympics which were held in different towns in Shropshire – e.g. the 1864 games in the Quarry Park, Shrewsbury, which was re-enacted in June 2011. The Shropshire Games were held in Oswestry between 1860 and 1880. According to a handbill recently discovered in the Shrewsbury records office, Oswestry also held an Olympic Games in 1834! Brooks instigated the National Olympic Games, which premiered at Crystal Palace, London, in 1865 and attracted 10,000 spectators and competitors. The Wenlock Olympics are still held annually. Shropshire therefore has a unique and proud association with the Olympic Games. The Olympic Torch arrived in Britain on 18 May 2012 and will spend 70 days touring the country to arrive in London the weekend before the start of the London Olympics on 27 July 2012. 8,000 torch-bearers are to be nominated. The route was announced in November 2011, it will go through villages, towns, cities and areas of outstanding natural beauty, it will pass through Oswestry on Wednesday 30th May. Each community will welcome the torch in its own unique way. The West Midlands is the only region to encourage Community Games inspired by London 2012. Community Games are allowed to use the purple “Inspired by London 2012” logo but are not allowed to use the word Olympics (or Olympiad, Olympians etc). The West Midlands Community Games are being promoted in Shropshire by Energize STW. The Olympics celebrate amateur sportsmanship. Athletes compete for the glory of a medal, with no cash prize incentive. The Oswestry Games will continue that tradition. 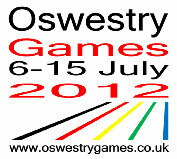 The Oswestry Games have been initiated by the Oswestry and District Sports Council. We hope that The Games will provide a unique opportunity for the people of the Oswestry area to celebrate together in the Olympic spirit of Excellence, Friendship and Respect. The Games are not a money-making venture. The organising committee are working in a voluntary capacity and the competitions hosted by local voluntary sports clubs will be the back-bone of the Games. As the organisers of the Oswestry Games, we will provide a Games Kit for events including banners/flags, Oswestry Games medals, and a medal podium. We will produce a combined programme of events to encourage spectators to watch the competitions and a web-site which will keep everyone informed of last minute changes, and results as they come in. There will also be an Oswestry Games mascot, Olly M which participants will be able to use in their publicity and we will co-ordinate a central publicity campaign. Since Oswestry Sports Council is a small committee of volunteers, we will appreciate additional volunteers to help with these central tasks! In Olympic year, we want to inspire the young and not-so-young to have a go. Why not join in and experience some of the great sports and arts opportunities that we have right here on our doorstep. There are lists of clubs here and here. Get in touch and ask...what can I do in the Oswestry Games?